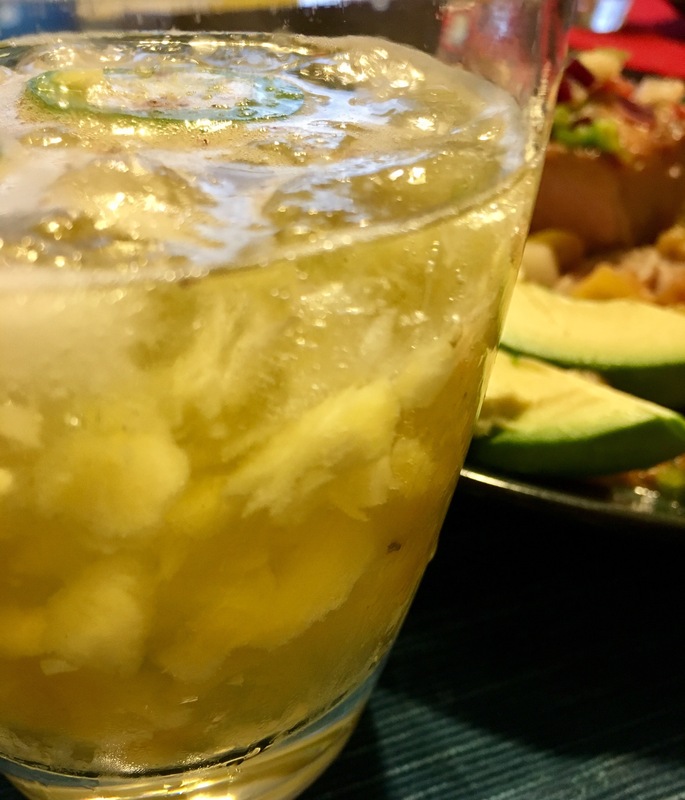 Tropical Dinner and Drinks! 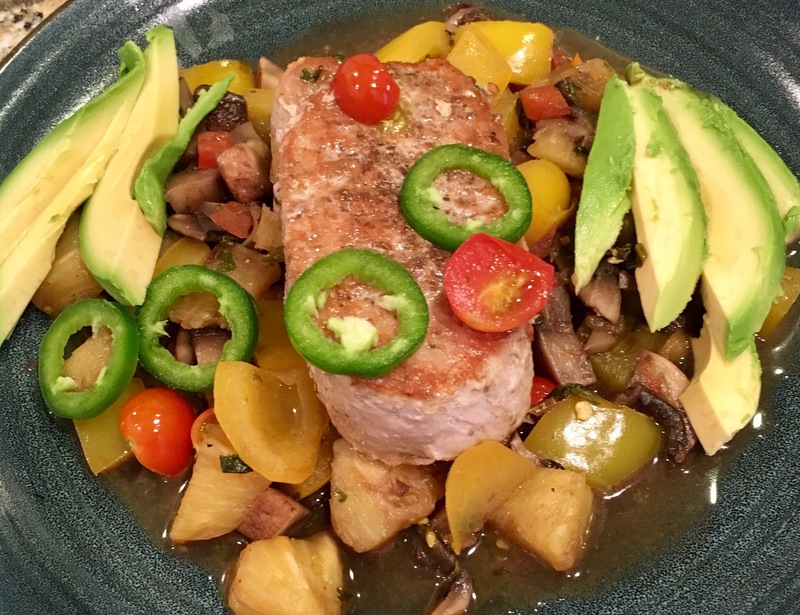 – Eat, Drink, and Go! I guess I was in a tropical mood last night. 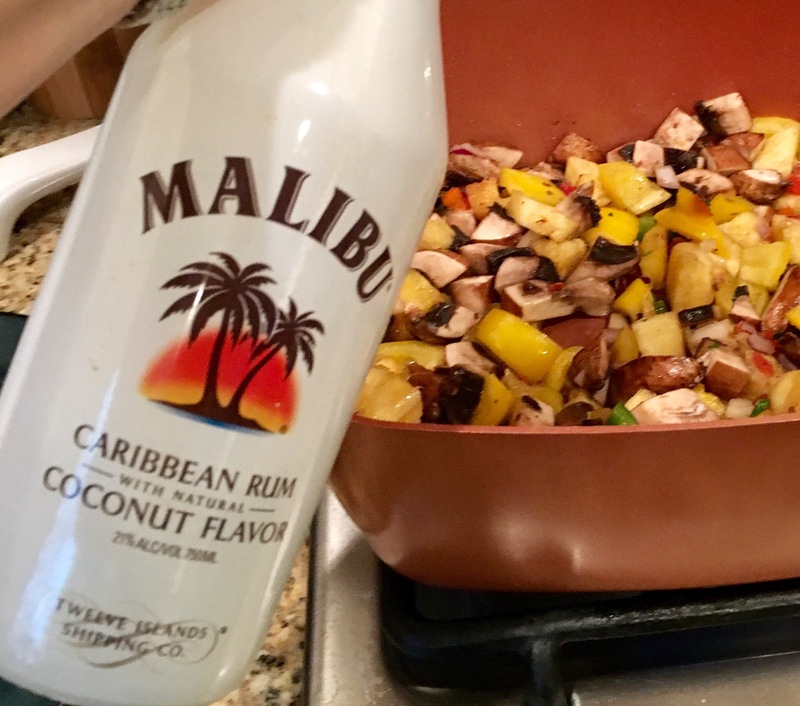 Made a dinner with the idea in mind to use up some leftover fresh salsa, got insipired by some fresh pineapple, found a bottle of Malibu Rum in the liquor cabinet (that never goes bad, right? ), and put it all together! I’m going to tell you about both the dinner and the cocktail here. First the eats. I had already made the salsa. 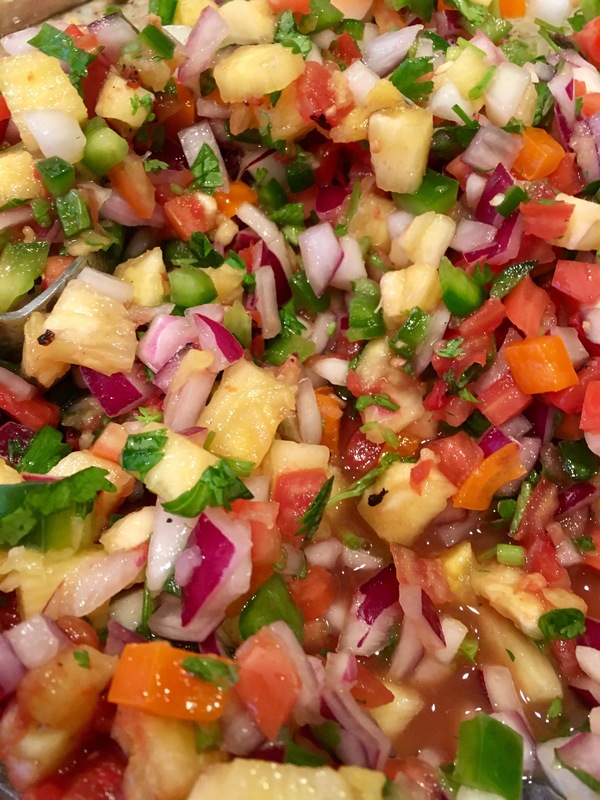 Just chop up all of the following and let it refrigerate at least overnight: bell peppers, tomatoes, red onion, jalapeño, cucumber, pineapple, cilantro, and a bunch of lime juice. 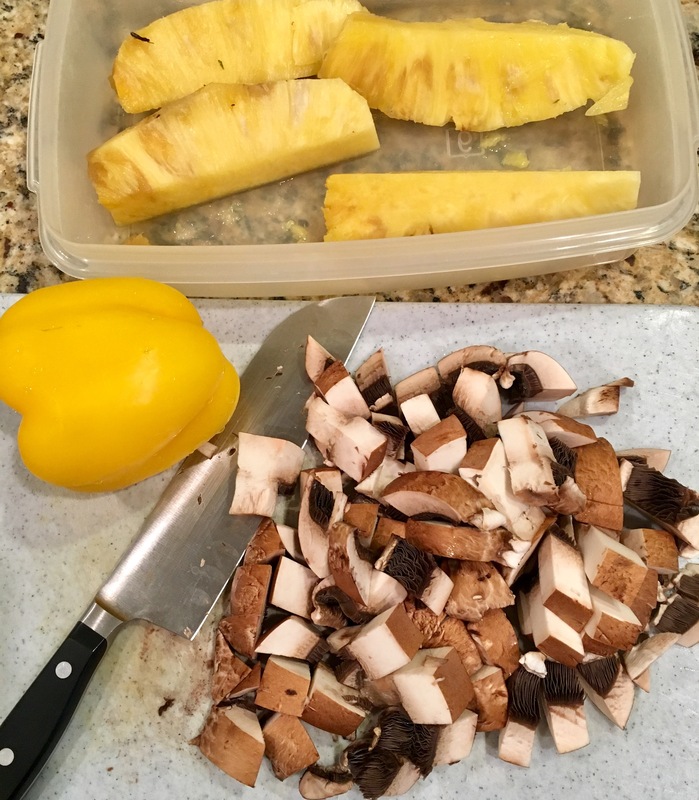 I decided on pork for the protein and some portabellas, yellow pepper, and pineapple for the base. 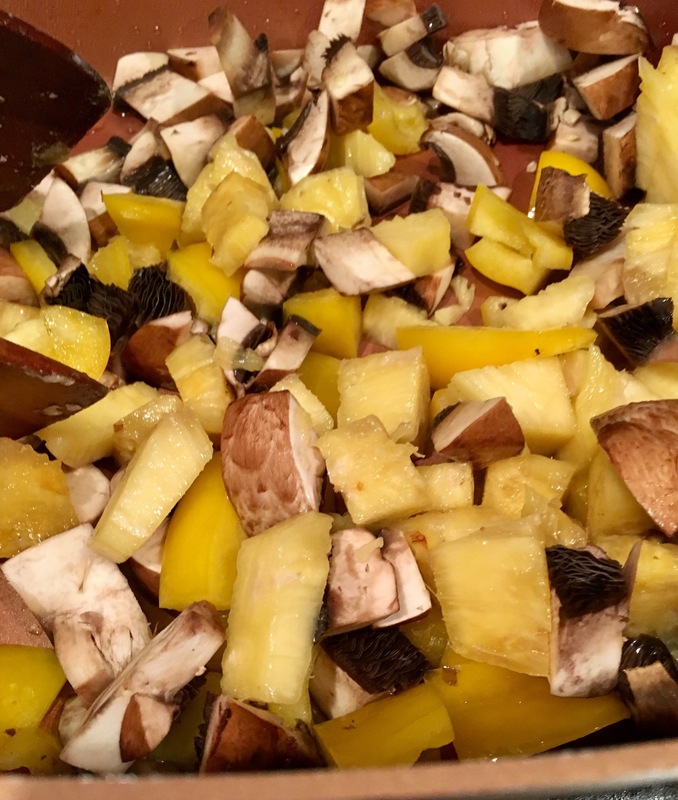 I cut up the produce in big chunks. Then I got them in my copper chef pan on a medium heat to simmer and get juicy. 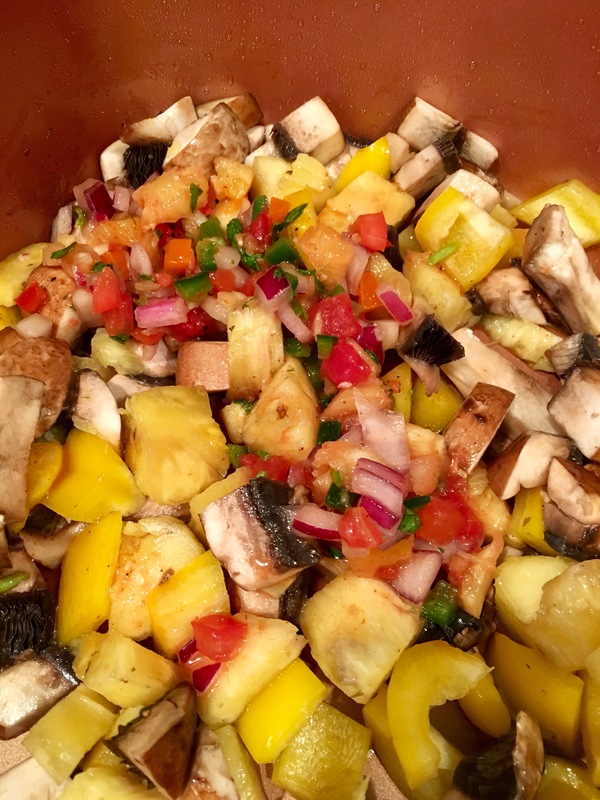 I added in some of the salsa and a heavy hit of Malibu Rum. I didn’t used to like Malibu Rum back in the day, hence why I have had this bottle for so long. 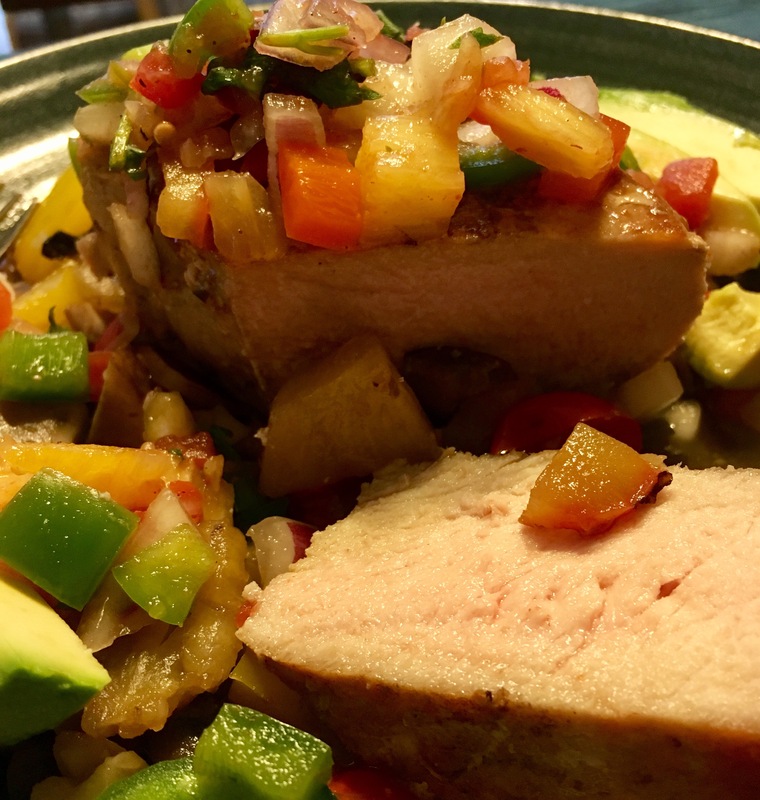 But I thought it’d work great with this dish and the drink, and it did. 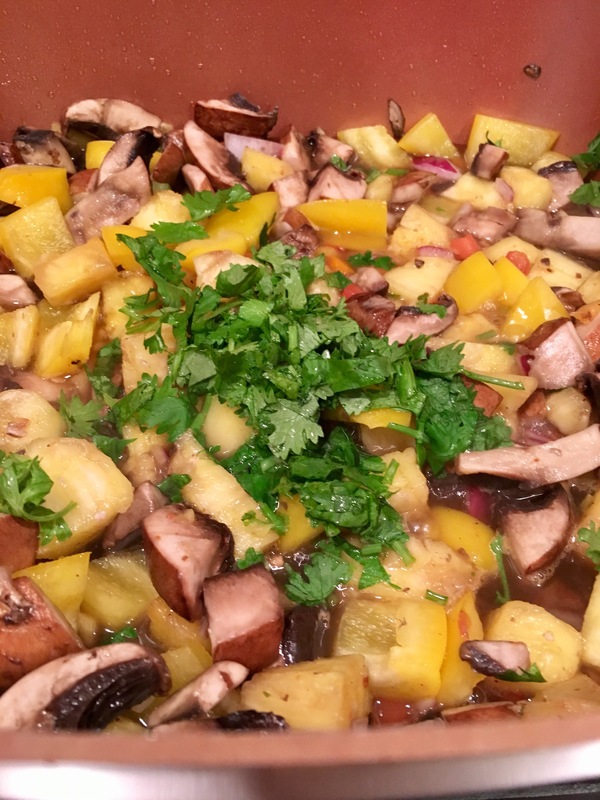 I added some more freshly chopped cilantro. I know some people don’t care for cilantro and think it tastes like soap. You could omit it or sub in another fresh herb. I happen to love cilantro. 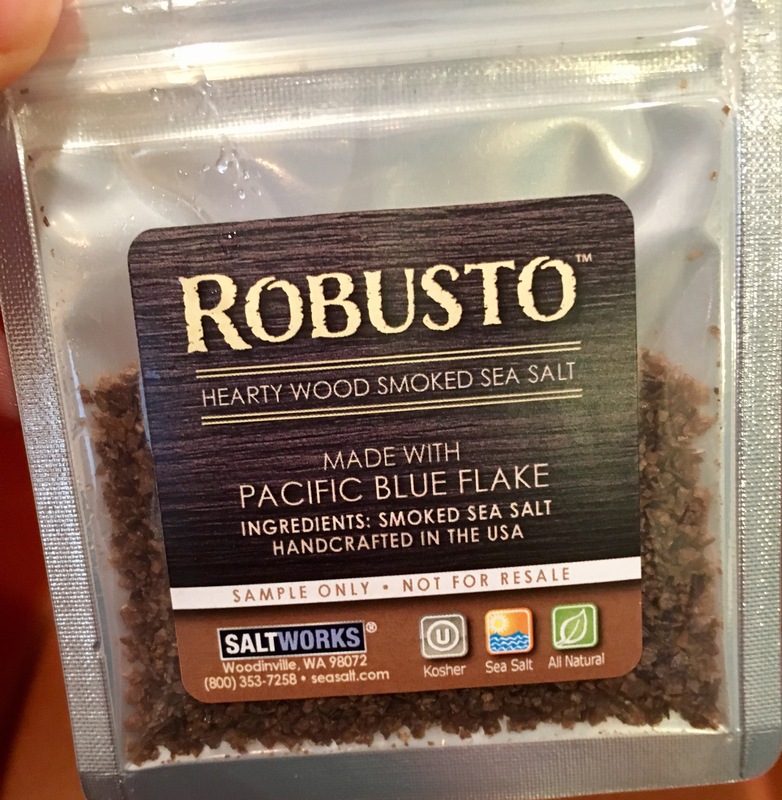 I sprinkled on the pork some delicious smoked sea salt by Salt Works. I love this salt!! You can really smell the smokiness before you even taste it!!! Wait til you see what I did with it in the drink! 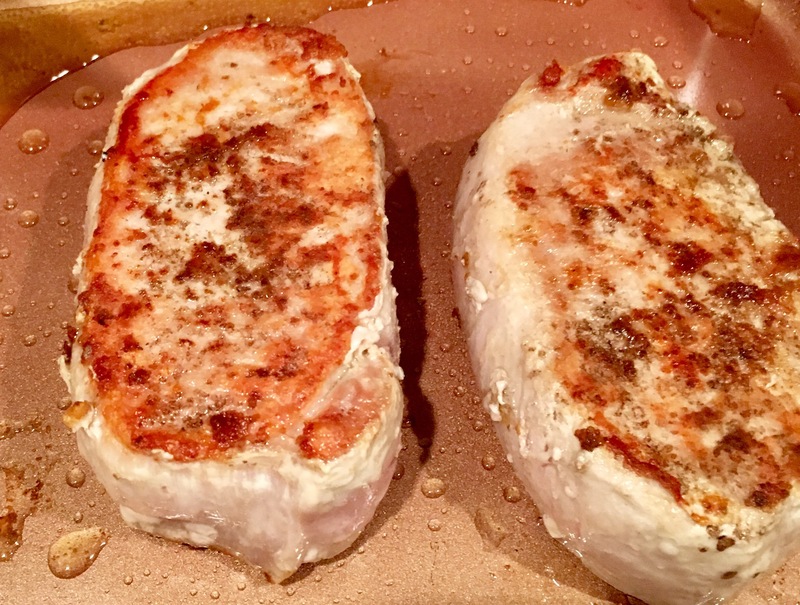 Lightly sprinkle on both sides of the pork and then sear the chops. Just sear each side, then let rest. 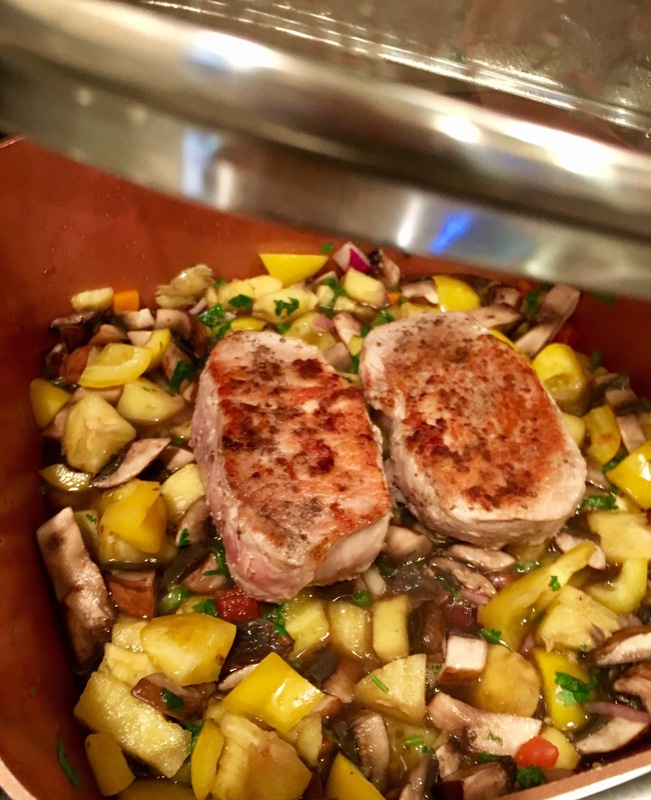 After the pineapple, peppers, and all have been simmering a while, add the pork back in on top to finish cooking it all together and cover. This smelled soooo good!! I knew it’d taste great too. 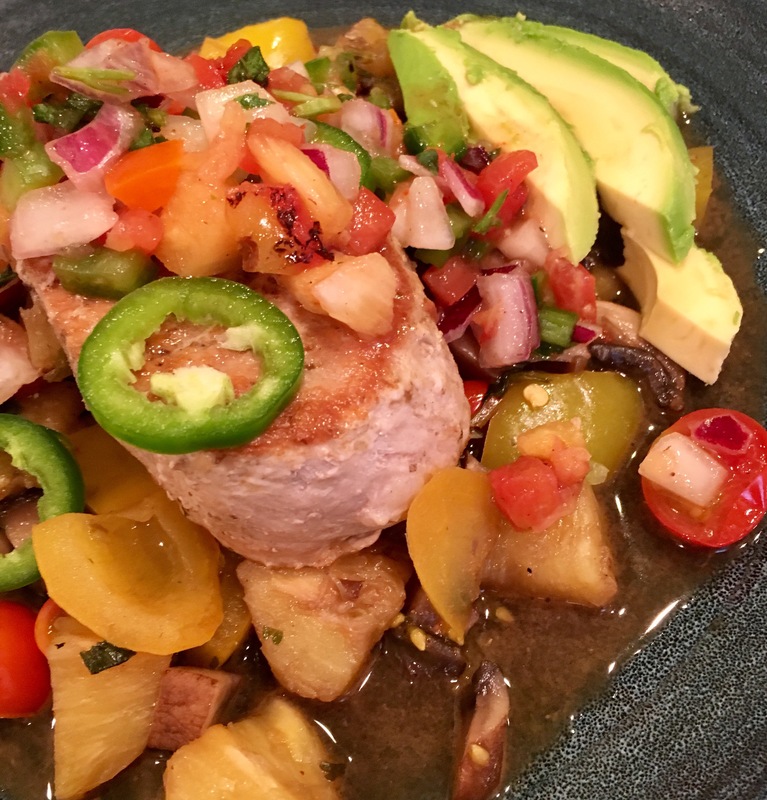 I placed down the bed of pineapple, peppers, and portabellas and then topped with the pork, and sliced a little jalapeño for a kick. And of course some avocado. 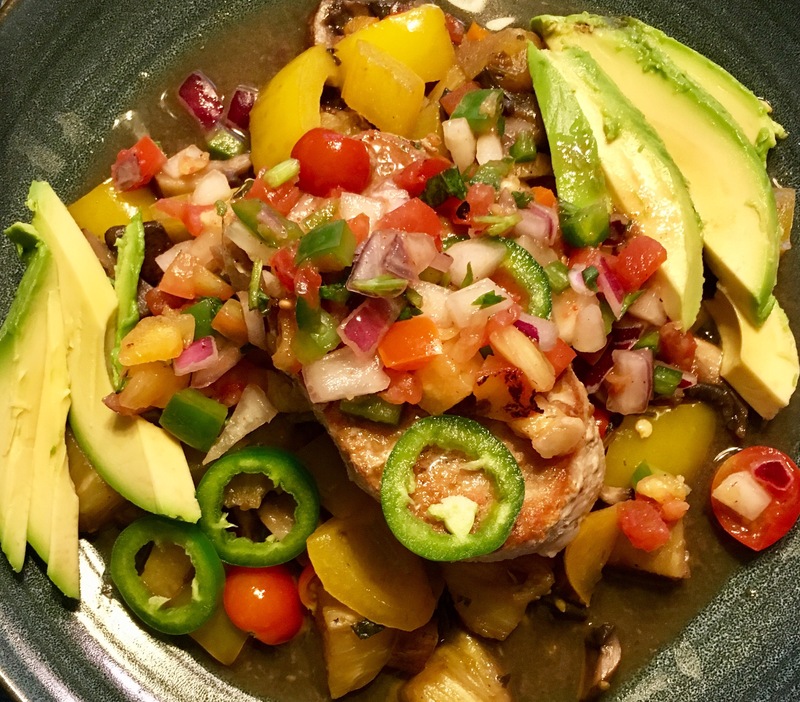 Then I topped it off with some of the fresh salsa. Now for the cocktail. I haven’t come up with a name for it yet. Maybe “Smokey Tropics?” I don’t know, let me know if you have a good one. 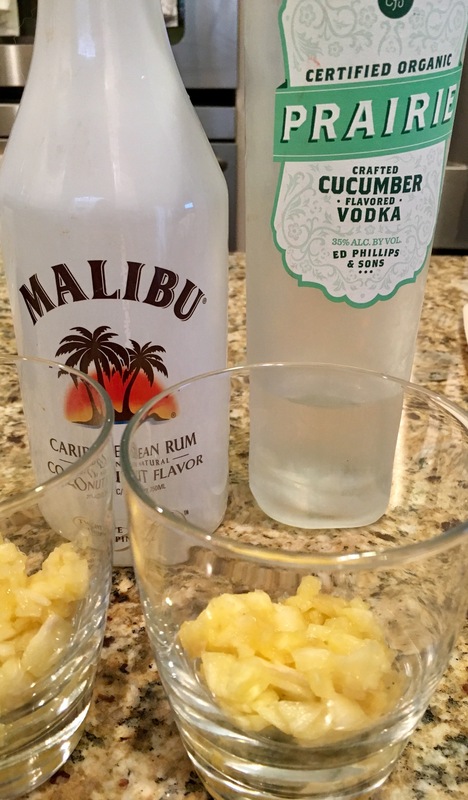 I started with some finely chopped pineapple in the glasses and some Malibu Rum and Prairie Cucumner Vodka to mix. I poured about two shots of Malibu and three shots of cucumber vodka into a shaker with more pineapple chunks. Shake vigorously with ice. Split between the two glasses and then scoop in the shaker ice. 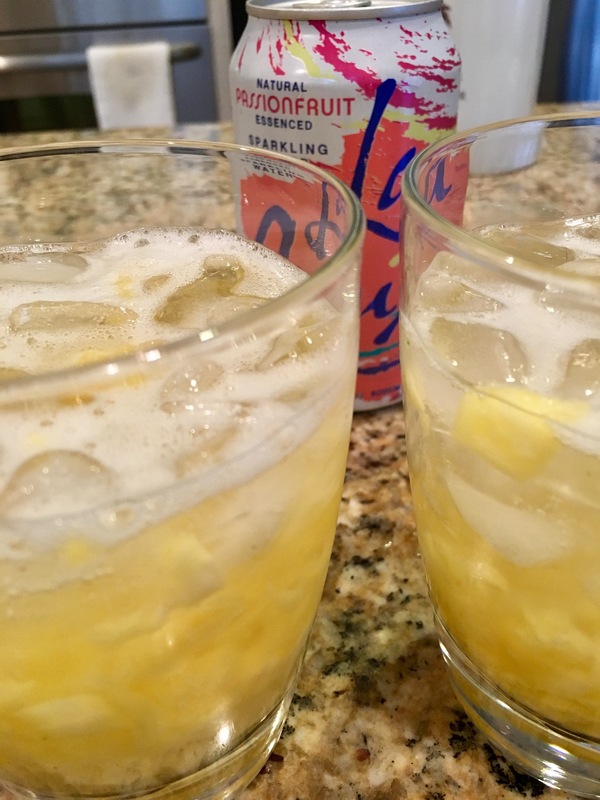 Then top each with some passion fruit sparkling water by La Croix. 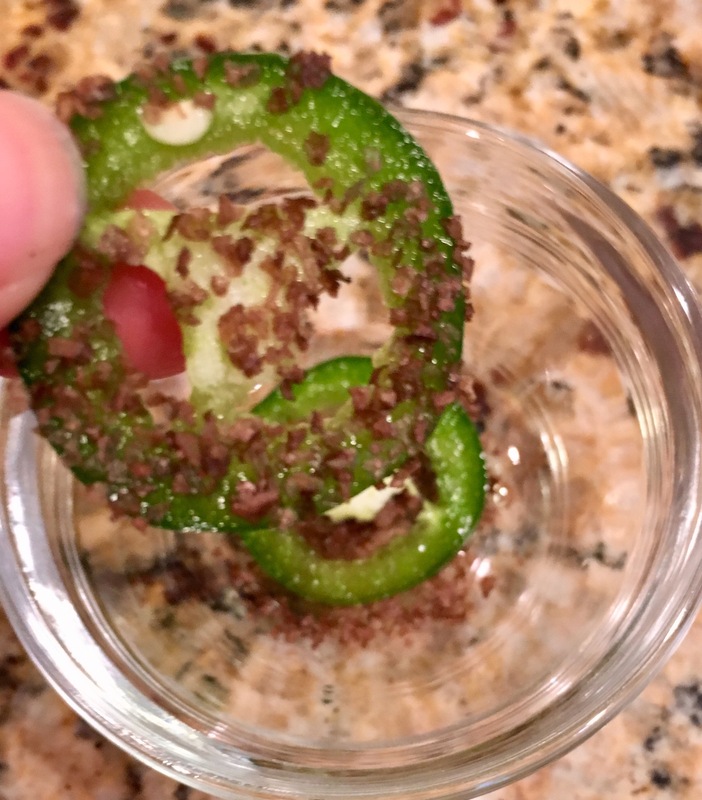 For garnish, I coated two jalapeño slices in the smoked sea salt. This was sooo cool. Each time I went for a sip, the first thing I smelled was smokey pineapple. I’m on a smoke kick this summer, hope you don’t mind it. 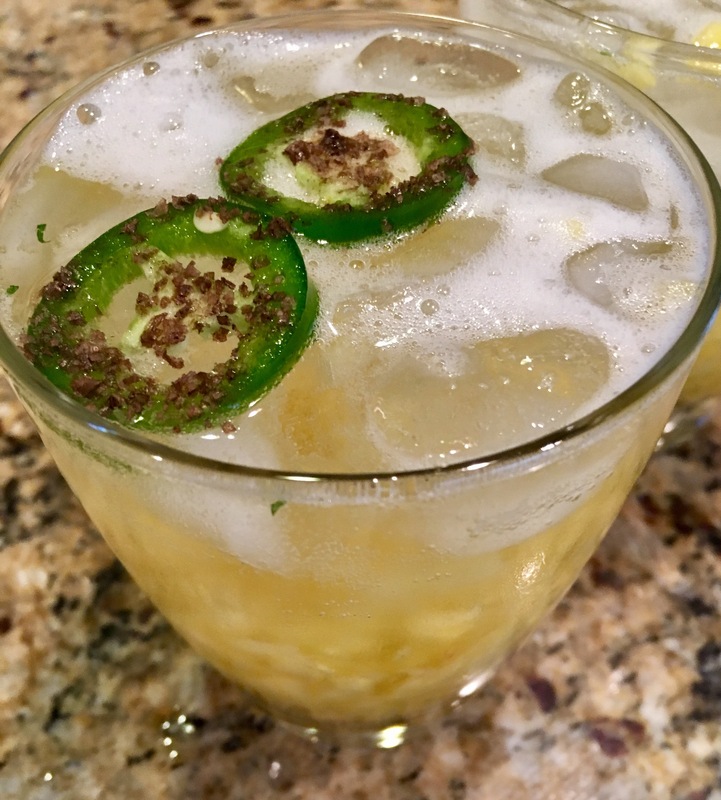 I usually pair dinner with beer or wine, but why not a cocktail?? How else could I get this tropical? You want the pork just a little bit pink inside for optimal cooking temp. And a look through the glass, just for a cool perspective!! Enjoy!